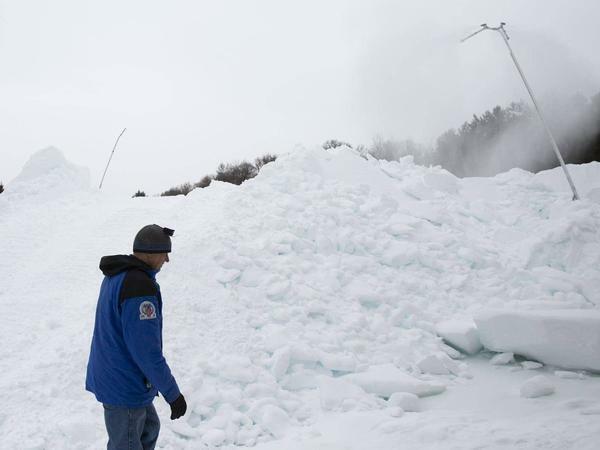 Volunteer Don Olson walks past a mound of artificial snow created by a snow gun on Tuesday at the Vasaloppet Nordic Ski Center in Mora, Minn.
Cross-country skiers have raced in Vasaloppet in Mora, Minn., since 1973. But Mora has only had enough natural snow once in the last seven years to put on the full race. He's 67, an engineer by day, and runs a 1,500-acre farm in the summer. In the winter, he farms snow. Part inventor, part stubborn Scandinavian, Olson drives a tractor that pulls a manure spreader he's jury-rigged to spray artificial snow on the Vasaloppet's 11-plus miles of the ski trail. One load of snow covers about 30 feet of trail. It will take the snow farmers about 2,000 loads to cover the 18-kilometer race course loop. "A lot of people have worked their tails off to create this race, to keep it going," he said. "At this point, I absolutely don't want to see this tradition die in Mora." A few years ago, Olson said, the possibility that the race might disappear was a real possibility. Vasaloppet organizers canceled the race in 2012 when there wasn't enough snow. It was the 40th anniversary of the race. "We had all kinds of plans," Vasaloppet USA president Debbie Morrison said. "And we had to cancel the race." Three years later, they scraped together every snowflake they could find just to make a 2-kilometer loop. "It was historically the shortest race, but we had a race," Morrison said. "But we knew, from that point on, we couldn't continue to do that. We had to take matters into our own hands." So the next winter, once it got cold enough, they started to make their own snow. The snow farmers were born — and they had three weeks to figure out how to cover the trail. Morrison said it was just in the nick of time. "There has never been enough snow since, and we've been dependent on our snow farmers making the snow for us," she said. The Mora Vasaloppet is a sister event to a race of the same name held in Mora, Sweden. The Scandinavian original runs 90 kilometers, the largest and oldest Nordic ski race in the world. The Minnesota event offers races in a variety of lengths, the longest of which is 54 kilometers. For years, the races started in one spot and ended in another. But with the changes in weather that brought on the need to make snow, organizers have revamped it so that it's now a loop race that begins and ends in downtown Mora. And now, every winter, Olson and his team of volunteers plant a ribbon of white snow through the woods at the Vasaloppet Nordic Ski Center, even if the surrounding ground is brown and uncovered. In the parking lot outside the Nordic Center, the snow farmers have set up a snow gun that feeds a giant pile of snow — sometimes 20 feet high — 24 hours a day, 7 days a week when it's cold enough. They use a skid loader to dump it into the manure spreaders. Then they pull the manure spreaders behind their tractors and out on the ski trail, scattering snow where it's needed. 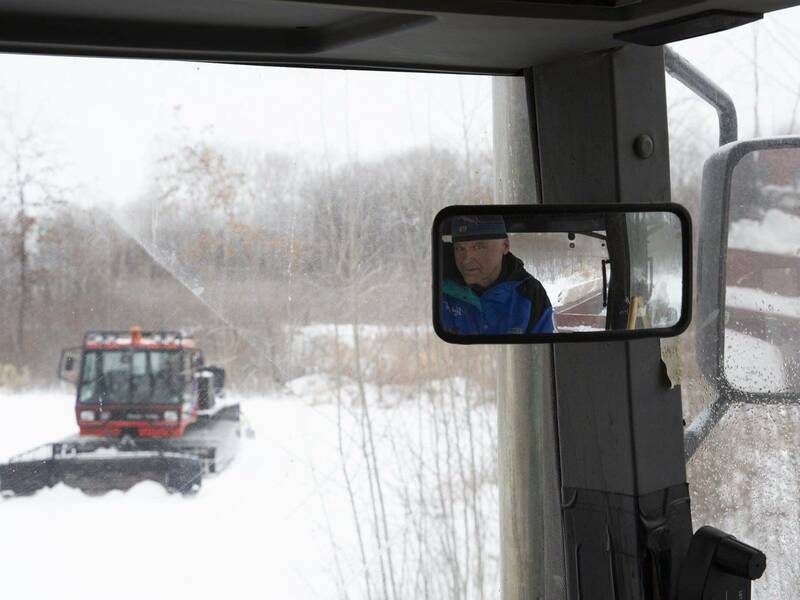 While sitting in a tractor, volunteer Don Olson waits for Lucas Olen to finish grooming a trail on Tuesday at the Vasaloppet Nordic Ski Center in Mora, Minn. Olson says a spreader holds about 15 cubic yards of snow, which will cover about 10 meters. Olson has seven snow farmers on his team, including a local farmer whose grandchildren race on the Mora High School team. A local doctor takes care of the snowmaking. Don's two sons, who also work at his engineering business, are also part of the team. Two other volunteers groom the trails. It's a lot like crop farming, Olson said. They don't punch a clock. They have a certain amount of work to get done, so they do it until it gets done. "We put in a lot of hours," he said. "I don't even keep track of them. My wife laughs because she never sees me because I don't get home until 10 or 11 o'clock at night. She's already gone to bed." The snow farmers have a limited amount of time to make and haul all the snow they need in order to get the race course ready. So sometimes, Olson said, he'll work 6 to 8 hours a day spreading snow — that's after he's finished his day job. "We hauled out probably at least a load and a half, if not two loads, for every skier in the race," last year, Olson said. "That's a lot of snow." He estimates that was enough snow to cover an acre — an area a little bigger than the size of a football field — with snow 15 feet deep. It can take a long time to dump just one load of snow. Sometimes the snow farmers have to make a 3-mile trip from the snow pile to the trail and back to dump just one load of snow. They've got plans to set up a second snowmaking site as they prepare for next year's race, which will shorten the amount of time they spend hauling. Since their start a few years ago, the snow farmers have slowly expanded the amount of artificial snow they've been able to make each year. And race registration has picked up again. This weekend, 1,200 people are skiing. That consistent snow coverage makes a huge difference for the Mora High School Nordic ski team, too, said coach Peter Larsen. One of the top skiers in the state is on this year's team. "We have our biggest team the school has ever had," he said. "We had 79 skiers on the roster this year — from a high school that graduates just over 100." Last year, the snow farmers were named Minnesota State High School Nordic Ski Coaches Association's volunteers of the year. In his nomination letter, Larsen called them "a generally Nordic-descended, Viking-stubborn, Einstein-crossed-with-MacGyver ingenious group of volunteers." "We would not be here today if we didn't have the snowmaking equipment," Morrison said. "It just wasn't going to be possible." Talk to any cross-country skier in Minnesota, and they'll say conditions have changed in recent years. In southern and central Minnesota, the only places to consistently ski are at parks that make artificial snow. Olson grew up on a farm just outside Mora. He's seen climate change firsthand. "I am absolutely convinced that the weather is changing — and changing fairly rapidly," he said. He's right: Despite last week's arctic blast, average winter temperatures in the Twin Cities have risen 6 degrees since 1970. That's one of the fastest rates of warming in the country. 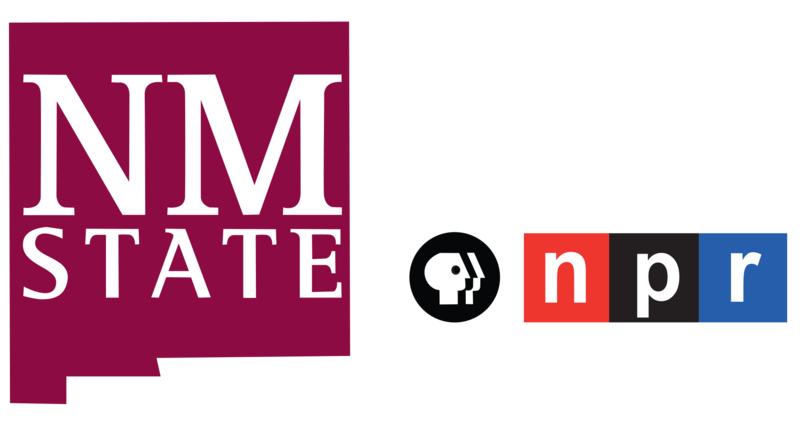 But climatologist Kenny Blumenfeld, who works with the Minnesota State Climate Office, said climate change hasn't necessarily meant less snow. It just means the snow is less predictable. "We're always going to have winter, so it would be kind of foolish to just get rid of the skis altogether," he said. "But I think the writing is on the wall. We've seen winter repeatedly kind of turn in a poor performance." Morrison said she doesn't know how much the snowmaking operation costs. It's hard to figure out. Olson and others have donated tens of thousands of dollars worth of equipment, fuel — and time. Morrison acknowledges it's something Vasaloppet organizers will have to figure out in the future, so they're not so dependent on volunteers. Olson figures someday they'll have to pay people to haul snow or install expensive snowmaking equipment. That's what some parks in the Twin Cities have done: Hyland Hills Ski Area, Elm Creek Park Reserve and Theodore Wirth Regional Park have all installed 5-kilometer loops with underground infrastructure and snowmaking equipment. But it's expensive. A a 3-kilometer ski track that opened in Duluth this year cost more than $3 million. Until Mora joins them, the city will rely on its snow farmers, who refuse to let climate change and poor snow years get in the way of a skiing tradition. "I will keep doing it as long as I can," Olson said. "As long as I'm capable, I guess is, what I hope to do anyway. So hopefully I'm doing it for another 20 years."